Luis Suárez volleyed the home side into the lead. However, Barça paid the price for losing focus as Madrid equalized through Cristiano Ronaldo who scored from close range four minutes later. Barça’s night become difficult after Roberto was shown a straight red for retaliating against Marcelo in an off-the-ball incident after Marcelo provoked him in the first place. Nonetheless, the Blaugrana were not going to back down in their own stadium. They took the lead in the 52nd minute through their magical player, Lionel Messi restored their lead with a memorable suprerb finish. However, Madrid’s extra man advantage paid off after Gareth Bale equalized with a brilliant strike in the 72rdminute. Both sides played the remainder of the game in search of a goal that never arrived. 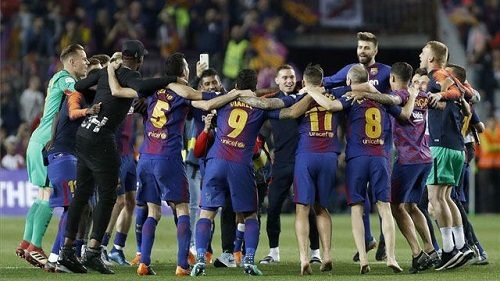 Although there was no guard of honor from Real Madrid for our league champions, they received one from the club’s staff at the conclusion of the match. 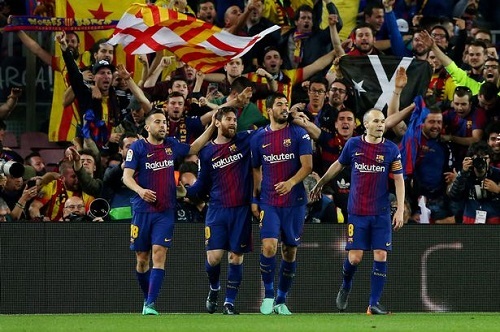 Barça only have three matches left, with home games against Villarreal and Real Sociedad and a trip to Levante in between, as they continue their quest to become the first club to go unbeaten in a 38-game La Liga season. FC Barcelona: Ter Stegen, Sergi Roberto, Piqué, Umtiti, Alba, Busquets, Rakitic, Iniesta (c), Coutinho (46′), Messi & Luis Suárez (90+2). Real Madrid: Keylor Navas, Nacho (Lucas Vázquez, 67′), Varane, Sergio Ramos (c), Marcelo, Casemiro, Kroos (Kovacic, 84′), Modric, Bale, Benzema & Cristiano Ronaldo (Marco Asensio, 46′). Goals: 1-0 Luis Suárez (min. 10); 1-1 Cristiano Ronaldo (min. 14); 2-1 Messi (Min. 52); 2-2, Bale (min. 73). Cautions: Nacho (12′); Varane por derribar a Suárez (30′); Suárez & Ramos (44′); Messi (45′); Bale (77′) Semedo; Marcelo (77′); Rakitic (85′). Previous PostBarça win 25th league title after 4-2 victory over Deportivo. Next PostBarça remain unbeaten after 5-1 victory over Villarreal.